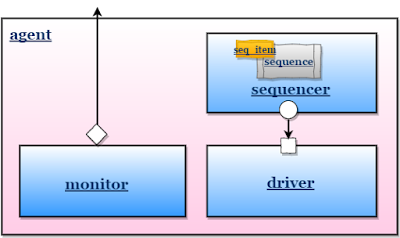 user-defined agent is extended from uvm_agent, uvm_agent is inherited by uvm_component. An agent typically contains: a driver,sequencer, and monitor. Agents can be configured either active or passive. Active agents generate stimulus and drive to DUT. 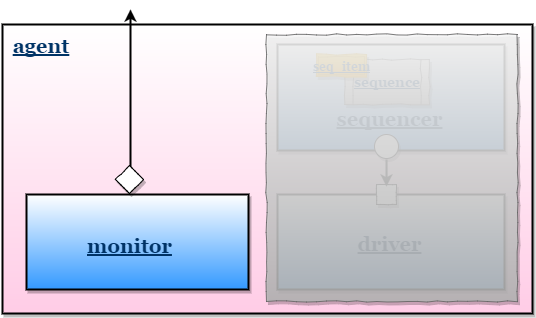 Active agent should contain all three components driver,sequencer, and monitor. Passive agents samples DUT signals but does not drive them. Passive agent should contain only the monitor. Agent can be configured as ACTIVE/PASSIVE by using set config method, default agent will be ACTIVE. set config can be done in env or test. get_is_active() Returns UVM_ACTIVE if the agent is acting as an active agent and UVM_PASSIVE if the agent acting as a passive agent. driver and sequencer will be crated only for active agent. 4. Connect the driver seq_item_port to sequencer seq_item_export for communication between driver and sequencer in connect phase.